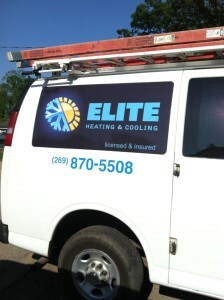 Elite Heating and Cooling is locally owned by Andy Richardson and Thomas Mendham. Both have over 12 plus years experience in the residential, commercial and industrial HVAC industry. Education includes degree’s from Ferris State University and KVCC with licensing from the State of Michigan and the Environmental Protection Agency. We provide our customers with the highest level of quality products and workmanship while maintaining absolute integrity in everything we do. The heating and cooling industry is ever changing and Elite is committed to continually educating customers of the cutting edge technology available to them for energy savings. Elite is a Trade Ally with many of the local energy providers including: Consumers Energy, Efficiency United (AEP, Semco Energy), Energy Optimization ( Midwest Energy) allowing us the opportunity to provide rebates to customers of new equipment and inspections to help lower the cost of maintenance and unit replacement. For our residential and commercial customers Elite is installing only the highest quality and reliable equipment available on the market today. This was a simple decision because every Trane product is designed down to every detail and rigorously tested for reliability and durability. We install Trane furnaces, air conditioners, heat pumps, humidifiers, air filters and thermostats. “It’s hard to stop a Trane”. We also carry the world leader in ductless systems Diakin. For our commercial geothermal customers we carry Bosch/Florida Heat Pump a leading manufacturer of Water Source and Geothermal Heat Pumps. Bottom line we stand behind the products we install 100% and believe they offer the highest quality, reliability and highest efficiency on the market today.